I had a need for a Qt widget that could display PDF. That turned out to be surprisingly hard to do. The Qt Wiki has a page on Handling PDF, which suggests only two alternatives: QtPDF, which is C++ only so I would need to write a wrapper to use it with Python (and then anyone else who used my code would have to compile and install it); or Poppler. Poppler is a common library on Linux, available as a package and used for programs like evince, so that seemed like the best route. But Python bindings for Poppler are a bit harder to come by. I found a little one-page example using Poppler and Gtk3 via gi.repository ... but in this case I needed it to work with a Qt5 program, and my attempts to translate that example to work with Qt were futile. Poppler's page.render(ctx) takes a Cairo context, and Cairo is apparently a Gtk-centered phenomenon: I couldn't find any way to get a Cairo context from a Qt5 widget, and although I found some web examples suggesting renderToImage(), the Poppler available in gi.repository doesn't have that function. The line to set text antialiasing is not optional. Well, theoretically it's optional; go ahead, try it without that and see for yourself. It's basically unreadable. ... after which you can use size.width() and size.height(). They're in points. There are 72 points per inch, so calculate accordingly in the dpi values you pass to renderToImage if you're targeting a specific DPI or need it to fit in a specific window size. That worked, but when I added resizeEvent I got an infinite loop: paintEvent() called resizeEvent() which triggered another paintEvent(), ad infinitum. I couldn't find a way around that (GTK has similar problems -- seems like nearly everything you do generates another expose event -- but there you can temporarily disable expose events while you're drawing). So I rewrote my PDFWidget class to inherit from QLabel instead of QWidget, converted the QImage to a QPixmap and passed it to self.setPixmap(). That let me get rid of the paintEvent() function entirely and let QLabel handle the painting, which is probably more efficient anyway. renderToImage gives you one image corresponding to one page of the PDF document. More often, you'll want to see the whole document laid out, with all the pages. So you need a way to stack a bunch of widgets vertically, one for each page. You can do that with a QVBoxLayout on a widget inside a QScrollArea. I haven't done much Qt5 programming, so I wasn't familiar with how these QVBoxes work. Most toolkits I've worked with have a VBox container widget to which you add child widgets, but in Qt5, you create a widget (no particular type -- a QWidget is enough), then create a layout object that modifies the widget, and add the sub-widgets to the layout object. There isn't much documentation for any of this, and very few examples of doing it in Python, so it took some fiddling to get it working. This may explain why I've been seeing an increasing number of these ill-behaved programs that come up with their titlebars offscreen. But if you want your programs to be better behaved, it works to self.resize(width, height) a widget when you first create it. The current incarnation of my PDF viewer, set up as a module so you can import it and use it in other programs, is at qpdfview.py on GitHub. A week ago I got back from a trip to the Chiricahua mountains of southern Arizona, specifically Cave Creek on the eastern side of the range. The trip was theoretically a hiking trip, but it was also for birding and wildlife watching -- southern Arizona is near the Mexican border and gets a lot of birds and other animals not seen in the rest of the US -- and an excuse to visit a friend who lives near there. Although it's close enough that it could be driven in one fairly long day, we took a roundabout 2-day route so we could explore some other areas along the way that we'd been curious about. First, we wanted to take a look at the White Mesa Bike Trails northwest of Albuquerque, near the Ojito Wilderness. We'll be back at some point with bikes, but we wanted to get a general idea of the country and terrain. The Ojito, too, looks like it might be worth a hiking trip, though it's rather poorly signed: we saw several kiosks with maps where the "YOU ARE HERE" was clearly completely misplaced. Still, how can you not want to go back to a place where the two main trails are named Seismosaurus and Hoodoo? 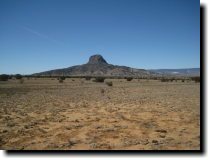 The route past the Ojito also led past Cabezon Peak, a volcanic neck we've seen from a long distance away and wanted to see closer. It's apparently possible to climb it but we're told the top part is fairly technical, more than just a hike. Finally, we went up and over Mt Taylor, something we've been meaning to do for many years. You can drive fairly close to the top, but this being late spring, there was still snow on the upper part of the road and our Rav4's tires weren't up to the challenge. We'll go back some time and hike all the way to the top. We spent the night in Grants, then the following day, headed down through El Malpais, stopping briefly at the beautiful Sandstone Overlook, then down through the Datil and Mogollon area. We wanted to take a look at a trail called the Catwalk, but when we got there, it was cold, blustery, and starting to rain and sleet. So we didn't hike the Catwalk this time, but at least we got a look at the beginning of it, then continued down through Silver City and thence to I-10, where just short of the Arizona border we were amused by the Burma Shave dust storm signs about which I already wrote. Cave Creek Ranch, in Portal, AZ, turned out to be a lovely place to stay, especially for anyone interested in wildlife. I saw several "life birds" and mammals, plus quite a few more that I'd seen at some point but had never had the opportunity to photograph. Even had we not been hiking, just hanging around the ranch watching the critters was a lot of fun. They charge $5 for people who aren't staying there to come and sit in the feeder area; I'm not sure how strictly they enforce it, but given how much they must spend on feed, it would be nice to help support them. The bird everyone was looking for was the Elegant Trogon. 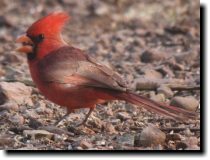 Supposedly one had been seen recently along the creekbed, and we all wanted to see it. They also had a nifty suspension bridge for pedestrians crossing a dry (this year) arroyo over on another part of the property. I guess I was so busy watching the critters that I never went wandering around, and I would have missed the bridge entirely had Dave not pointed it out to me on the last day. The only big hike I did was the Burro Trail to Horseshoe Pass, about 10 miles and maybe 1800 feet of climbing. It started with a long hike up the creek, during which everybody had eyes and ears trained on the sycamores (we were told the trogon favored sycamores). No trogon. 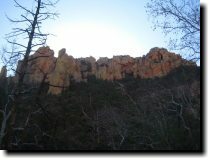 But it was a pretty hike, and once we finally started climbing out of the creekbed there were great views of the soaring cliffs above Cave Creek Canyon. Dave opted to skip the upper part of the trail to the saddle; I went, but have to admit that it was mostly just more of the same, with a lot of scrambling and a few difficult and exposed traverses. At the time I thought it was worth it, but by the time we'd slogged all the way back to the cars I was doubting that. 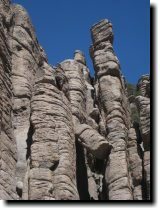 On the second day the group went over the Chiricahuas to Chiricahua National Monument, on the other side. Forest road 42 is closed in winter, but we'd been told that it was open now since the winter had been such a dry one, and it wasn't a particularly technical road, certainly easy in the Rav4. But we had plans to visit our friend over at the base of the next mountain range west, so we just made a quick visit to the monument, did a quick hike around the nature trail and headed on. Back with the group at Cave Creek on Thursday, we opted for a shorter, more relaxed hike in the canyon to Ash Spring rather than the brutal ascent to Silver Peak. In the canyon, maybe we'd see the trogon! Nope, no trogon. But it was a very pleasant hike, with our first horned lizard ("horny toad") spotting of the year, a couple of other lizards, and some lovely views. We'd been making a lot of trogon jokes over the past few days, as we saw visitor after visitor trudging away muttering about not having seen one. "They should rename the town of Portal to Trogon, AZ." "They should rename that B&B Trogon's Roost Bed and Breakfast." Finally, at the end of Thursday's hike, we stopped in at the local ranger station, where among other things (like admiring their caged gila monster) we asked about trogon sightings. Turns out the last one to be seen had been in November. A local thought maybe she'd heard one in January. Whoever had relayed the rumor that one had been seen recently was being wildly optimistic. Fortunately, I'm not a die-hard birder and I didn't go there specifically for the trogon. I saw lots of good birds and some mammals I'd never seen before (full list), like a coatimundi (I didn't realize those ever came up to the US) and a herd (pack? flock?) 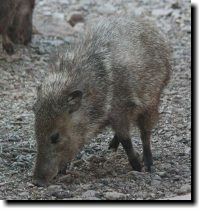 of javalinas. 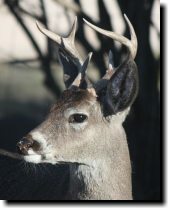 And white-tailed deer -- easterners will laugh, but those aren't common anywhere I've lived (mule deer are the rule in California and Northern New Mexico). Plus some good hikes with great views, and a nice visit with our friend. It was a good trip. On the way home, again we took two days for the opportunity to visit some places we hadn't seen. First, Cloudcroft, NM: a place we'd heard a lot about because a lot of astronomers retire there. It's high in the mountains and quite lovely, with lots of hiking trails in the surrounding national forest. Worth a visit some time. From Cloudcroft we traveled through the Mescalero Apache reservation, which was unexpectedly beautiful, mountainous and wooded and dotted with nicely kept houses and ranches, to Ruidoso, a nice little town where we spent the night. 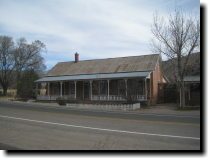 Our last stop, Saturday morning, was Lincoln, site of the Lincoln County War (think Billy the Kid). The whole tiny town is set up as a tourist attraction, with old historic buildings ... that were all closed. Because why would any tourists be about on a beautiful Saturday in spring? There were two tiny museums, one at each end of town, which were open, and one of them tried to entice us into paying the entrance fee by assuring us that the ticket was good for all the sites in town. Might have worked, if we hadn't already walked the length of the town peering into windows of all the closed sites. Too bad -- some of them looked interesting, particularly the general store. But we enjoyed our stroll through the town, and we got a giggle out of the tourist town being closed on Saturday -- their approach to tourism seems about as effective as Los Alamos'. Photos from the trip are at Cave Creek and the Chiricahuas.